my bug is missing the complete console, so I need to make a new one. What is it made from, fibre glass? Is there any stencil, drawing I can download? Yes its fibreglass but to my knowledge there isn't a detailed drawing. You may need to take measurements from a local Bug. It needs to be built properly as its the area where the canopy support strut puts aot of preasure. but as you can see there is no separate 'console' as such. I'm going to guess it's the fabric strip above the speedo to the steering column. Think the op needs to alaborate on this.. Im now confused on what part your refering to. Thought it was the complete binacle area but maybe its just the trim. ?? Not so easy to find a bug in my area, I'm in Germany! Ahhh This is not what we would normally call a 'console' in English - even though it seems Reliant did !! 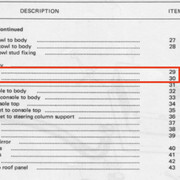 If you look at the parts list, you'll see that Reliant actually call this Part no. 1 "Console ASSEMBLY". By this, they mean a collection of parts (such as the trim, the ashtray, the rivets, the screws etc) which sit on TOP of the console. The "console" is actually just the area of the main body around the rear of the engine, which holds the instruments and switches - it's not a separate part. He is not listing the part 29 at present, but I am pretty certain he has offered it in the past, so either he will have old stock, or he will have a mould and can make a new part for you. The ashtray, if you want that as well, is a standard British Leyland/Mini etc part and is widely available on eBay. That just leaves part no 30. I do not know if you can get this from the same supplier, but it's worth asking him. Alternatively, you may be able to get used parts from a Bug that is being broken for spares, or is being modified and this part is no longer needed - erazor, are you out there? There are 2 versions of this part. One goes over the steering and has a hump in it where it goes over the column. This version is where the column is over the support bar. 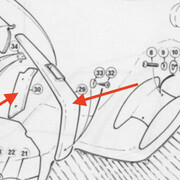 The other version looks like the one in the parts book and is flat at the end as it was designed for Bugs where the Steering column is under the support Bar. Thank you for the infos, I will check with customfibre on Ebay. The Bug Club and owners of Bond Bugs are a really nice bunch.